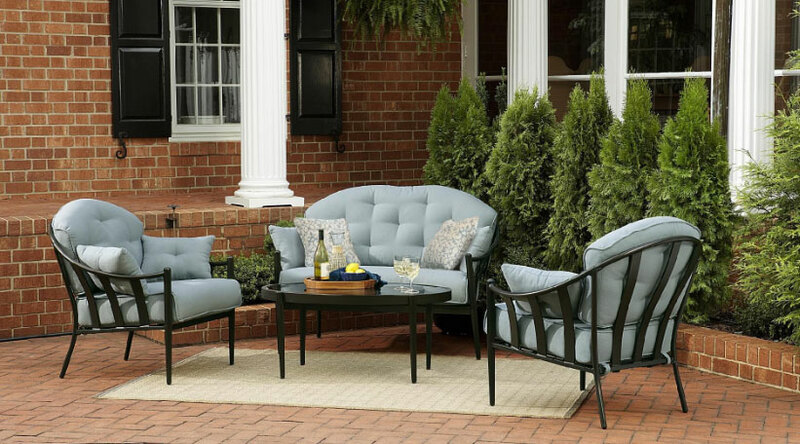 We provide step-by-step instructions for freshening up your outdoor furniture. As you inspect your deck and patio furniture this spring, you may notice that the pieces need freshening up. This might be especially true if you live in one of the states hard-hit by storms this past winter. Don’t worry: You may not need to buy new furniture. With the right products and a little elbow grease, those pieces can be in tip-top shape in no time. Wood, Metal and Plastic—You usually can clean dirt and grime from wood, metal and plastic patio furniture with a simple solution of detergent and warm water and a little elbow grease. If the pieces are especially dirty, just increase the amount of detergent in the solution. Wicker—You may need to let wicker furniture soak for a few minutes in the detergent and warm water solution before rinsing it off. For best results, rinse the furniture with a hose that has a strong stream, or with a pressure washer on a low setting. If needed, go back and carefully scrub hard-to-reach areas with a toothbrush. To keep slats from warping, dry them with a hair dryer. Wood Furniture—Bleach can discolor wood furniture, so the best way to clean it is with a bleach-free product designed specifically for this purpose. You can make your own solution by mixing 1 cup ammonia, ½ cup white vinegar, ¼ cup baking soda and a gallon of water. Apply the mixture to the furniture with a sponge or rag and then rinse. Wicker—Wicker is a little trickier to clean but by no means impossible. First, wipe down the wicker with a warm mixture of detergent and water. Apply the mixture liberally, so that it seeps between the slats of the wicker. Allow the mixture to sit for a few minutes, then rinse it and dry it as described for removing dirt and grime. Metal—Metal plastic furniture is the easiest to clean. Use a commercial solution for mold and mildew or one of the homemade solutions described above and then rinse. You also can use a bleach solution, but be sure to keep it away from plants and animals. Viola! You’re done. Plastic—Plastic, like wood, can discolor with the wrong products. For best results, use detergent and warm water. Scrub the surfaces clean and then rinse. Cushions and Umbrellas—Bleach and chemicals can discolor outdoor fabrics. To avoid both, rub a solution of lemon juice and salt in a circular motion on the fabrics then rinse. While this is an organic cleaning solution, test it on a small area first. Paint touchups can be accomplished by traditional painting or spray painting. The latter works better for wicker and for any pieces that may have lattice work, decorative cutouts or other hard-to-reach places. In either case, sand down the chipped or damaged areas to make sure they are smooth. Then clean and wipe each piece before painting. Traditional Method—You may need to apply a primer first, especially if you’ve sanded down to bare wood or metal. Once the primer has dried, brush on exterior paint in thin coats, allowing the paint to dry in between coats. Be sure to use a good-quality exterior paint and primer and equally good-quality brush designed for the project. Your local paint store can help you in your selections. Decorative Finishes—Applying a decorative finish to your furniture is easy, too. For a white-washed look, dilute acrylic paint with water and brush it on in very thin coats, allowing each coat to dry thoroughly. Keep applying the coats until you achieve your desired looks. For a distressed look, lightly sand finished paint coats in strategic areas. To protect the pieces, apply a coat of exterior sealer. Once your furniture is back in tip-top shape, you can defend it from future dirt, grime, mold, mildew and other “invaders” by treating it with one of the no-scrub cleaning/protection products on the market. Some of these products even work with weather, like wind and rain, to keep the products looking like new. Again, ask your paint retailer for suggestions on the best products for your furniture.